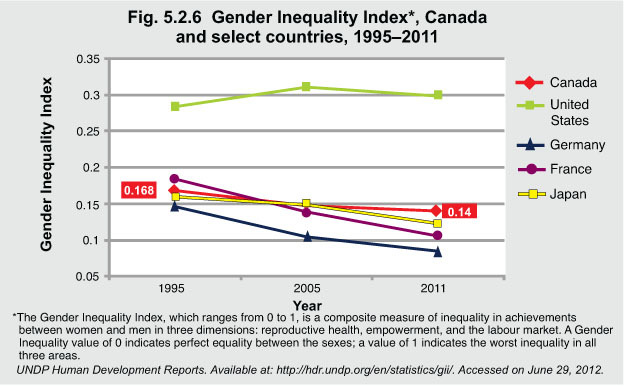 Worldwide, gender inequality improved from 1995 to 2011. Over that time, Canada’s index value improved slightly, from 0.168 to 0.140. In comparison, in the United States, gender inequality worsened between 1995 and 2011. Although women’s participation in the labour force has been increasing, women continue to earn less than men in Canada. Given that the majority of lone-parent families are headed by females, it is problematic that women are still earning less than men. 1Ferrao V. (2010). “Women in Canada: A Gender-based Statistical Report: Paid Work.” Statistics Canada. Available at: http://www.statcan.gc.ca/pub/89-503-x/2010001/article/11387-eng.pdf -accessed on June 29, 2012.